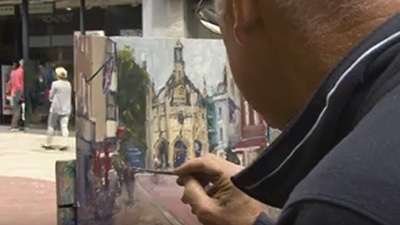 Distilling the Scene is Ron Ranson's third instructional video and in it he concentrates on the fundamentals of design in painting rather than on the techniques of applying pigment. He begins by emphasising the need to be selective and to exercise discrimination in deciding what to include and what to reject - decisions which demand equal skill of the artist. He divides the concept of design into seven constituent parts balance, harmony, gradation, dominance, contrast, variation/alternation and unity - and deals with each in turn. 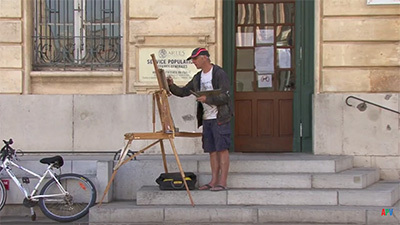 He illustrates his points by producing a series of simple thumb-nail sketches, using either watercolour or graphite stick, and by showing a number of his finished paintings. The notion of 'balance' is illustrated by a child's see-saw, with figures of equal weight either side of the fulcrum, and he goes on to show that balance is mechanically possible if one of the figures is increased in size, but moved closer to the point of balance. 'Harmony' is mainly concerned with colours in close proximity on the colour wheel, while 'gradation' encompasses such matters as the transition from strong to weak tone or from warm to cool colour. 'Dominance' is achieved by using very dark or very bright colours and 'contrast' is all about placing lights against darks and vice versa - in other words counterchange. 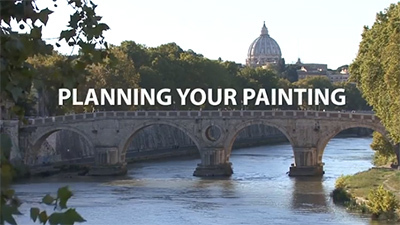 The need to introduce variety to provide interest comes under the heading of 'variation/alternation' and includes varying the size, the shape, the tone and the colour of objects within the painting. Finally, 'unity' is the quality which brings it all together and ensures a satisfactorily cohesive whole. He stresses the need to produce a working sketch before embarking on the painting proper, a vital stage which he finds many students omit altogether, and believes tone to be just as important as line in the preliminary study. 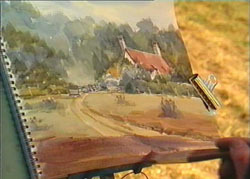 There follow three demonstration paintings in the field, two in the garden of his home near Chepstow and one by the River Wye near Tintern Abbey. For these he uses his familiar range of brushes, the hake, the one-inch flat and the rigger, and applies his pale washes boldly and freely. 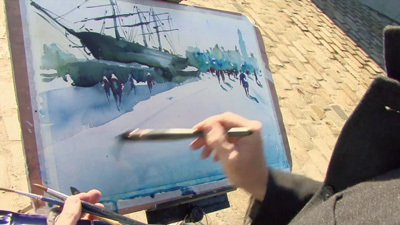 He tackles his skies by covering the paper with very dilute raw sienna to which he adds equally liquid washes of pale blue. 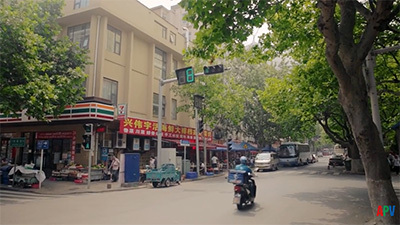 He frequently refers to the colours he is using in general terms such as 'blue, grey, yellow, green' and so on rather than by their more precise names, understandably, perhaps, in a video primarily devoted to the notion of design. 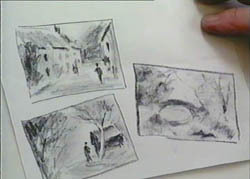 The programme ends with a showing of some of Ron Ranson's atmospheric watercolours, with the artist commenting upon various aspects of their underlying design. This tape is produced by one of the professional organisations devoted to the production of quality art instruction videos by leading artists and is a far cry from some of the unsatisfactory cut price products at present on offer. The vision, sound and production are all first class. 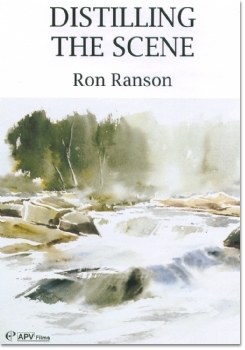 Distilling the Scene by Ron Ranson is an ideal film for beginners wanting to get some structure and impact into their approach to watercolour and their use of composition. Ron Ranson starts with a look at the main principles of design: balance, harmony, gradation, dominance, contrast. variation and alternation, and unity. 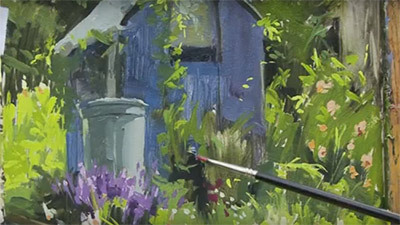 The do's and don'ts of these are discussed and illustrated in reference to simple colour demonstrations and some of his finished paintings. 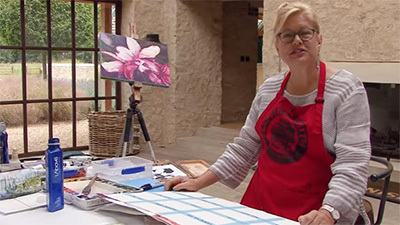 After showing us how to make and use the tonal sketch as a preliminary to painting, Ron tackles three different location watercolours in which the design principles as well as other considerations are put into practice.